The 1926 Duluth Eskimos (a.k.a. 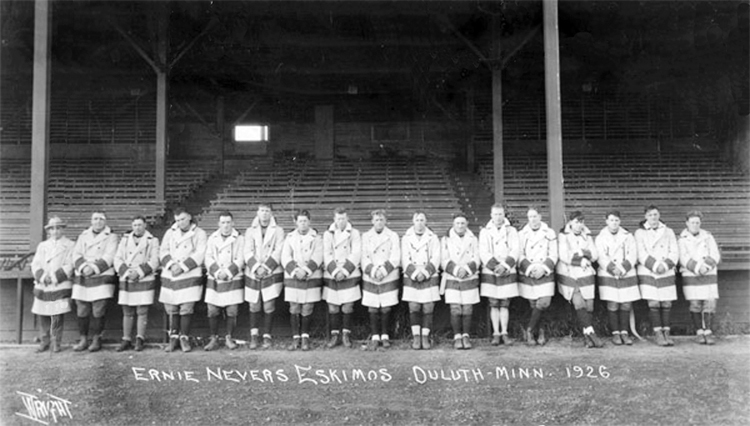 “Ernie Nevers’ Eskimos”) posing in their custom-made mackinaw jackets at training camp in Two Harbors, Minnesota (even though the photo identifies the location as “Duluth”; both locations are in doubt as neither town was known to have a facility like the one the team is standing before). From left: Ole Haugsrud (owner), Walt “Chet” Gayer, Dewey Scanlon, Walt Kiesling, Russ Method, “Jock” Murray, “Porky” Rundquist, Joe Rooney, Ernie Nevers, Art Johnson, Jack Underwood, “Cobb” Rooney, Bill Stein, Johnny “Blood” McNally, James Manion, “Oke” Carlson, and Paul Fitzgibbon (not shown: Charles “Doc” Kelly, “Red” Sullivan, “Doc” Williams, “Red” Quam, Jimmy Manion, and Wally Gilbert). Photo courtesy the Two Harbors Public Library via the Lake County Historical Society. In 1923, the Zenith City’s Kelly-Duluth Hardware store sponsored a professional football team in the early National Football League. The team was led by Quarterback/coaches Joe Sternaman and Dewey Scanlon and featuring hometown hero Wally Gilbert, who gained national fame as the Brooklyn Dodgers’ third-baseman, once drop-kicked a 61-yard field goal. the Kelley-Duluth, aka the Duluth Kelley’s, amassed a record of 10–6 from 1923 to 1925 (NFL scheduling was erratic at the time). The Green Bay Packers came to town and faced the Duluth team at Athletic Park only once in 1924, and the home team prevailed 6–3. In the 1920s, professional football was at best chaotic. College ball was the real deal, and back then “college men” went to work—they didn’t keep playing football. So when University of Illinois legend Red Grange started his own league in 1926, the National Football League’s very existence was threatened. With Grange’s immense popularity, fans would be drawn to the new league. That year, 26 year-old team manager Ole Haugsrud from Superior, Wisconsin, purchased the team and convinced his high school friend all-American Stanford running back Ernie Nevers to join the team. Kelley-Duluth would be renamed the Duluth Eskimos and known nationwide as Ernie Nevers’ Eskimos. Nevers led the Eskimos, played professional basketball in Chicago, and pitched in the majors—all in the same year. They began the year with the NFL’s first-ever training camp, held in Two Harbors, Minnesota, then played one game at home before hitting the road to cover 17,000 miles playing 13 regular-season games and 16 non-league games in 4 months. They often took the field with only 13 players, and Nevers played all but 29 minutes of the 29 hours the Eskimos were on the field. They played to a 6–5–3 record in their NFL games, with one of the ties a 0–0 draw in Green Bay. Along the way, the Eskimos became national celebrities, known for their signature mackinaw jackets, custom made for the team by Duluth’s Patrick Woolen Mills. They were also the first team in the NFL to have a logo on their uniforms, which were white trimmed in a deep blue. It was said the Eskimos took two showers after games, the first with their uniforms on—no time for laundry. The following year Nevers took over as coach, but the team did not play well, closing the season with a 1–8 NFL record. The first game of the year was a 20–0 loss in Green Bay. The Eskimos never once played in Duluth that season. The following year the Eskimos folded. Haugsrud retired the Eskimos name in 1928 when he sold the Duluth franchise back to the league. He didn’t get much money, but one stipulation of the sale was a piece of paper stating that if the NFL ever awarded a franchise to Minnesota, Haugsrud would be offered an opportunity to invest in the team. He cashed in that promissory note to become part owner of the Minnesota Vikings, who many believe were named for his and Ernie Nevers’ alma mater, Superior Central High, whose sports teams wore purple and gold and called themselves the Vikings. He also recruited Bud Grant to coach the Vikings. In 1963, Nevers was part of the first class of inductees to the NFL Hall of Fame along with former teammate Johnny “Blood” McNally and Bronislau “Bronco” Nagurski of International Falls, Minnesota. In 1929, Edwin Simandl, owner of the Orange Tornadoes—an amateur team from New Jersey—purchased the franchise and his team went pro; the next two years the Tornadoes played in Newark, then forfeited the franchise in 1931 because of financial problems. In 1932, Boston investors led by George Preston Marshall purchased the franchise. The team played at Braves Field, home of the Boston Braves of baseball’s National League, and so Marshall also named his team the Braves. In 1933, Marshall’s team moved to Fenway Park and he changed the name to “Redskins.” In 1937, he moved the team to Washington, D.C., where they have played ever since. Read the entire history of the Duluth Eskimos in our book Leatherheads of the North by Chuck Frederick. From Leatherheads of the North: The True Story of Ernie Nevers & the Duluth Eskimos by Chuck Frederick (Zenith City Press, 2007). Click on the cover to preview the book.